All you need to do is step foot in Hong Kong to know its culture and people are skyscraper crazy. Hong Kong houses the world's tallest, the International Commerce Centre which stands at an impressive 484m. The city houses many other monuments which climb and soar including the Giant Buddha on Lantau Island and The Peak, a hugely popular lookout point which boasts out-of-this-world views of the city skyline. If theme parks are your thing, head to Hong Kong Disneyland or Ocean Park, your gateway to first-class thrills and more carnival rides than you can imagine. 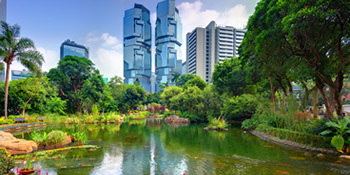 Hong Kong is renowned for its shopping and you won't have to look far to find a crazy bargain, fantastic outlet store or world-class shopping centre. If you're feeling hungry, enjoy some of the region's fantastic street food or dine at one of the many restaurants that line the city streets. Hong Kong International Airport is served by trains, buses, taxis and ferries, so getting to accommodation clustered in the city is easy. Book yourself some Hong Kong accommodation and immerse yourself in the Asian supercity with a skyline that dazzles all year round. Honking great deals. Find one below.